Our customers are often faced with the tricky decision as to whether they should pay a consultancy to do their Aerodynamic development or whether to take the plunge and do it in-house. TotalSim can help with both of these routes, but perhaps one of the most popular options for our customers is somewhere in the middle, where TotalSim can work seamlessly with our customers to help provide more value for money. The more we communicate with our customers, the better the results and this usually means a happier customer! One of the latest tools in our armoury to enable the customer to be kept in the loop is Bramble. Live force table with direct access to the post-processing images and movies. This allows our customers to be kept up to speed with everything we are doing from any web browser. 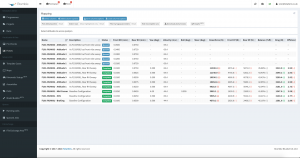 Our development path is shown live to the customer allowing them to see when new runs are queued up and the results, with access to all the forces and post-processing our engineers are using to make decisions. This has been a huge step forward in building trust with our customers and helps us to show the added value of using TotalSim rather than an in-house team. The customer can interrogate the results whenever and as much as they want. Many of our customers do not have the capacity or desire to run a full time aero department, but with access to the results as if they were being created internally, there is little benefit to hiring people and buying computational resource. 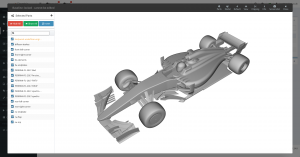 The aero/CFD department can be turned on and off as need be, which for many teams and OEMs this helps control costs. Bramble’s assembly builder allows you to upload geometry to simulate via the browser. Some of our customers also chose to setup and run their own simulations via Bramble. The framework is in place for customers to submit their own geometries and pay per run or on a subscription basis. Bramble allows TotalSim to bridge the gap between CFD consultancy and in-house departments. Perhaps most importantly it allows our customers to choose (and change their mind) as to how much they want to do and how much they use external resource.